Many homeowners are unaware that insulation can offer a “soundproofing” benefit. We tend to use the terms sound transmission control or sound attenuation since they are more accurate. Soundproofing insulation is usually crafted from mineral wool, fiberglass, or cotton and cellulose materials. To control the transmission of sound, there are many options. 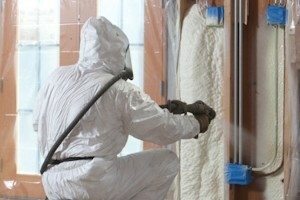 Fiberglass insulation is what most people typically think of to get the job done. Open cell spray polyurethane foam might also be a great solution, since it would help keep sound OUT of the building envelope. Each material offers its own pros and cons. There are many different options to help soundproof a space, including a variety of insulation types. Here are some surprising and little-known facts about insulation for noise reduction. The use of rigid panel mineral wool, also known as rockwool, is recommended for soundproofing a room. They can also be purchased in softer batts as opposed to rigid panels. Rockwool is sold in sizes for use with ceilings, floors, and residential interior walls. This type of insulation can be purchased in a high-performance type or a multi-purpose type. High-performance mineral wool offers some of the best low and high-frequency ratings and is considered to be extremely cost effective. Most brands use natural stone fibers, also making this product fire, water, and moisture resistant. Although its main purpose is soundproofing. Multi-purpose mineral wool is slightly lower in ratings for sound absorption, however, they have better thermal insulation capabilities. A multi-purpose mineral wool insulation can be placed on the inside and on top of standard thermal insulation in order to protect from unwanted sound. This type of mineral wool product is a lower cost product that is also soft and flexible. It can be purchased in different sound absorption capabilities, some for low frequency and some for high frequency. Fiberglass insulation performs basically the same as mineral wool when it comes to soundproofing. It also comes in a similar thickness, yet costs more. This is because fiberglass is better at insulating than mineral wool. While fiberglass insulation may cost more, it serves two purposes. For smaller projects, homeowners or builders may want to consider cotton soundproofing. This option is affordable and performs well. Cotton materials are soft and need the support of a frame or other covering. Those building their own acoustic panels or other smaller projects will want to use cotton soundproofing materials. To learn more information on insulation, contact USI online to find a branch near you and get a free quote. USI believes in excellence in every step of the process and ensures timely completion and quality of service, time after time.